Ninjas are awesome. 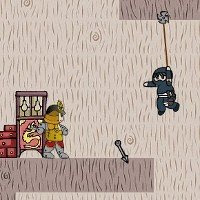 Developers Chris Fuller and HybridWing are obviously aware of this fact, and their game Ninja + lets you explore your “inner ninja,” with its combination of solid platforming and cool rope-swinging gameplay. Your objective is simple: Collect all of the coins on each level, while avoiding traps and killing enemies. In addition to the standard running and jumping, you can do some decidedly ninja-like things, such as wall-jumping, wall-sliding, and rope-swinging. The rope mechanic is implemented very well, and zipping around a level is simultaneously challenging and satisfying. Bats, attack-dogs, and evil samurai will attack you on site. Thankfully, you have an unlimited supply of “kunai” (throwing knives), which you’ll use to do battle. You’ll also need to be on the lookout for hidden spike traps so you can avoid impaling yourself. Ninja + is a fun little game. Its presentation probably won’t blow you away, but the fast action and enjoyable rope mechanics (not to mention the large number of user-created levels) should keep you happily swinging into action for a while.